Soon the autumn leaves of red and gold will appear and at Homestead the harbingers of autumn have begun to debut—pumpkins, corn stalks, and gourds. We’ve also got plenty of apples, including the best-selling Honey Crisp, an apple “designed” to be a crowd pleaser. The Honey Crisp is the result of researcher David Bedford’s use of cross pollination techniques at the University of Michigan. That pleasing crunch and clean fracture in every bite was engineered; the cells of a Honey Crisp are actually twice the size of other apples. Patented from 1991-2008, the Honey Crisp earned the University of Michigan more than ten million dollars in royalties! 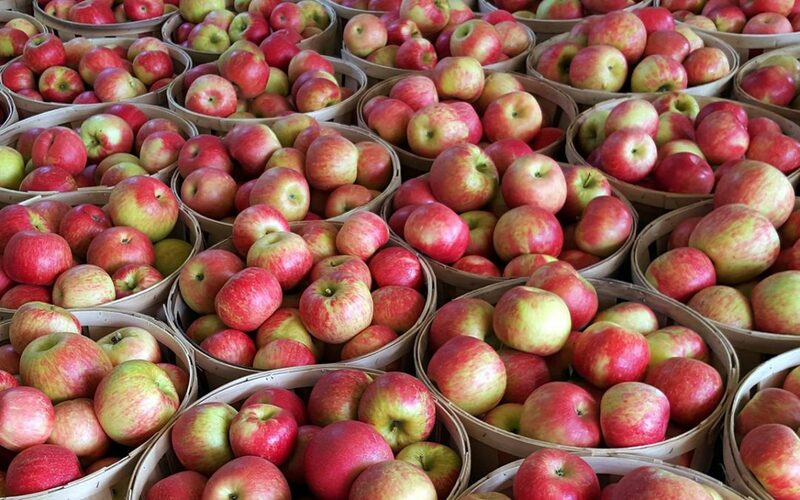 Homestead’s Honey Crisps come from Melick’s Town Farm in Oldwick which has been in operation since 1725 and is the largest apple grower in NJ. Winner of Outstanding Farmer of 2017 by the Garden State Culinary Arts Awards, Melick’s has over 650 acres of land with over 20,000 apple trees. Fulper Farm, a fifth generation family operation that produces wholesome, quality dairy products using environmentally friendly practices. We’re stocked up on their delicious Ricotta, fresh Mozzarella and Cheddar cheese as well as milk and Plain and Vanilla yogurt. Griggstown Farm, the gold standard of fresh, antibiotic free poultry. We carry a wide variety of their delicious products—Chicken; Turkey Burgers, Ravioli, Pot Pie; Chicken & Turkey Sausages, and Ground Turkey and Chicken. Bassett’s, another purveyor of wholesome old-fashioned goodness. Be sure to pick up a pint of their seasonal Pumpkin flavor ice cream for your Fall dessert menu. Quantity is limited, so get yours while it’s still available. Fall’s chill inspires hearty rib-sticking dinners and veal is the perfect protein to add to your table. It’s loaded with nutrient-rich zinc, niacin, Vitamin B-12 and B-6 and we’ve got rib chops, loin chops and ground veal from Eagle’s Nest Farm. With over 22 years experience, Eagle’s Nest is owned and operated by the Sigle family—Andrea, Bill and their daughter Emily. They raise Holstein calves on their 17 acre farm to provide local, free-range and antibiotic-free veal. The folks from Mt. Salem Lamb farm will also be on hand. Of course lamb is another nutrient-rich lean source of protein. Try this delicious Roast Lamb with Artichokes and Lemons. Doug Riexinger. founder of Grandpa Doug’s Soap, is a former chemist who began experimenting with soap-making 7 years ago. Doug was in search of a soap that would be free of the harsh ingredients and chemical additives of commercial soaps. His hand-crafted alternative is soap made from olive, coconut, or red palm oils, whole wheat or oat flour and scented with lavender an essential oil known for its long-lasting fragrance and therapeutic properties. Meet the guys behind HankSauce, a company created by college roommates Hank, Matt, and Josh who built their brand on a shared passion of the ocean and a summer of farmers markets. Come find out what makes their hot sauce, home-based in Sea Isle City, so hot it flies off the shelves of their local taco shop and everywhere else.